In July, with the ousting of President Mohamed Morsi and instability in Egypt and particularly in the Sinai, Egypt's policy toward the Gaza Strip changed dramatically. Travel through the Egypt-Gaza border crossing, Rafah, was restricted and the crossing was closed 29% of the time (including Fridays and holidays). A sharp drop in the amount of goods entering Gaza – including fuel, building materials and basic food products – was recorded over the month of July as a result of an increased presence of Egyptian security forces in the region, the destruction of an unknown number of tunnels, and a self-imposed halt in activities by tunnel operators who feared that if their operations were detected, security forces would destroy their tunnels. Given that Israel prevents all sea and air access to and from the Gaza Strip and restricts movement through its own border crossings with the Strip, Gaza residents have come to rely on Rafah as a connection to the outside world. While the movement of people and goods between Egypt and Gaza declined, movement between Israel and Gaza increased: the number of exits by Palestinians from Gaza to Israel via Erez Crossing rose by 29% and the amount of goods entering the Gaza Strip via Kerem Shalom Crossing rose by 38%. Because of Israel's significant control over the Gaza Strip, it has an obligation under the law of occupation, to allow Gaza residents to lead normal lives, including the ability to enter and exit the Strip. So long as travel through Rafah is not possible, Israel has an obligation to allow Gaza's residents to exercise their right to freedom of movement through other crossings. The fact that Israeli authorities oversaw an increase in exits of people traveling through Erez and the amount of goods coming in through Kerem Shalom is a good thing. It should be noted that the average monthly number of individuals exiting Gaza through Rafah dropped from 20,000 to 6,281 in July and more than 10,000 people who needed to travel remained stranded in the Gaza Strip. 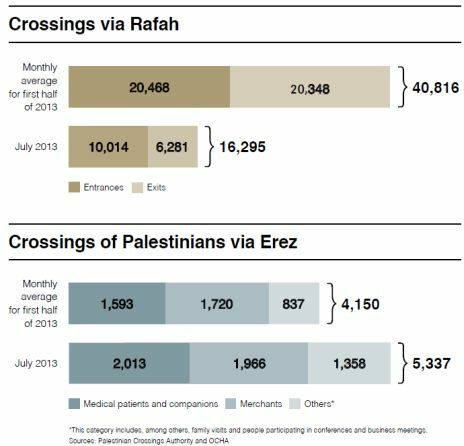 Increasing the number of exits through Erez by 1,187 in July helps but it is still far from making up for the restrictions at Rafah. At the same time, increased activity at Erez and Kerem Shalom does show that more movement is possible. Israel has the means to significantly scale up operations at the crossings, in accordance with international commitments it has undertaken and without compromising the security of its citizens.